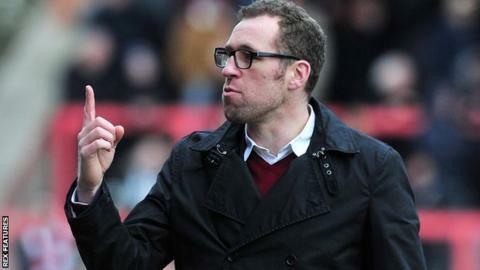 Crewe Alexandra manager David Artell has warned his players that they could end up "with a job as a milkman" if the club are relegated from League Two. Since taking charge following Steve Davis's sacking in January, Artell's side have won just twice in nine games. And he labelled Tuesday's 4-0 loss at Hartlepool, which left the Alex just seven points clear of safety, as "the worst performance" since he took over. "Relegation means oblivion for everyone," he told BBC Radio Stoke. "I've told the players they have a choice: either work hard and improve, or it's oblivion. That's for their careers, this football club and every one of us. "They'll end up in the Conference North on £200 a week with a job as a milkman." The game at Victoria Park turned when Dave Jones' Hartlepool scored just before half-time, before going on to add three more in the final 30 minutes. "We saw again the fragility after going 1-0 down," said Artell. "Once the second goal went in, we relaxed and just lost all structure. It was the worst performance since I've taken charge." Crewe were not helped at Hartlepool by the absence of defender Jon Guthrie, who has now been ruled out for three weeks to undergo a hernia operation. "Jon has been playing with a hernia over the last few weeks," said Artell. "He has played for as long as he could but he cannot go on any longer and will now have an operation on Friday." What's next for the Alex? Crewe, relegated in May 2016 after four seasons in League One, are 20th in the fourth tier. They are a point above Accrington Stanley and Hartlepool, seven clear of 23rd-placed Orient and 10 clear of bottom club Newport County. Should they be relegated, Crewe face the prospect of losing their place in the Football League for the first time since 1921. But Crewe's fate remains in their own hands, as three of their final six home games are against Notts County, the team just one place above them (14 April), Newport (11 March) and Leyton Orient (22 April). Crewe's other three home games are against play-off hopefuls Colchester United, Cambridge United and Barnet. Three of their final six away games are at automatic promotion contenders Portsmouth (4 March), Carlisle United (25 March) and Plymouth Argyle (29 April). The other three are all against other lower-half sides - Crawley (16th), Accrington (21st) and Yeovil (17th).